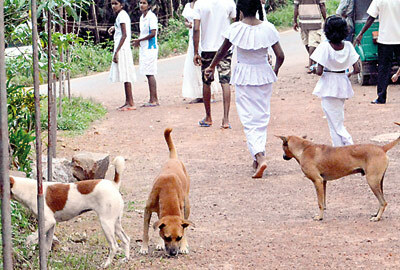 Alarmed by the deaths of 22 people due to rabies this year, the Health Ministry has intensified the battle against the deadly disease — with dog owners being urged to get their pets vaccinated immediately. Last year 19 persons died of rabies, while annually around 3,600 people sought treatment for rabies in public hospitals countrywide, costing the state a staggering Rs. 350 million a year, Public Health Vet Services Director Dr. Lionel Harischandra said. He said most of the cases were due to dog bites although people had sought treatment for rabies after being bitten by squirrels and other home reared-animals. In 80 percent of the cases, the victims, including owners, neighbours and visitors, were infected with the disease after being bitten by household dogs. Also most of the cases were reported from the Western Province. One of the reasons for the high incidence of cases is the failure of pet owners to keep track of the time the rabies vaccine was to be administered. Dr. Harischandra said if pet owners were not sure about the date, they should seek the assistance of health authorities. He also said most people also tended to ignore the bites and this could be fatal at times, if treatment was not sought immediately, especially if the dog was a stray one. Dr. Harischandra said that after a dog bite it was important to monitor the dog for 14 days. If the dog lives for more than two weeks after the bite, the dog can be cleared of the disease. “If the dog dies, then the victim has to be treated immediately,” he said. The Health Ministry spends about Rs. 1.5 million a year to vaccinate around 150,000 dogs every year. The ministry also conducts mobile units around the country administering the rabies vaccine to both household and stray dogs. Dr. Harischandra said the mobile teams also visit schools, factories, markets and roadsides to vaccinate dogs. 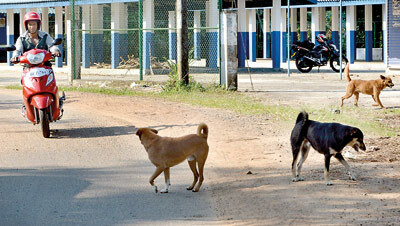 He said stray dogs are vaccinated from a distance, using auto plungers.